First we had IQ. Next came EQ. Now, Bruce Nussbaum introduces CQ — Creative Intelligence. 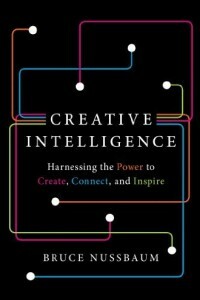 In his new book Creative Intelligence: Harnessing the Power to Create, Connect, and Inspire (Amazon, BN, or IndieBound), Nussbaum, a former assistant managing editor of Businessweek and a current Professor of Innovation and Design at Parsons-The New School of Design, makes a spirited case for moving creativity to the center of our lives and our companies. He shows that being creative isn’t some natural gift, but the product of hard work. And he introduces five new competencies—Knowledge Mining, Framing, Playing, Making, and Pivoting—that can boost the creative potential of individuals alike. Because his book is so interesting, I asked him to answer a few questions for Pink Blog readers. 1. You say we often fail to recognize our own creativity. Is this connected in any way to our concept of the “lone genius”? What can we do to tune in to our creative moments when they’re happening? We have many myths about creativity–it’s rare, it’s special, it’s a result of brain activity, it’s just weird. But anyone who uses tools, who cooks, who comes up with a fresh business model, who uses Instagram, who makes a music playlist, who writes an original school paper is “doing” creativity. So our first step in tuning in to our creative moments is simply to be mindful of our own creativity. Recognize and reflect on what you do in your career and in your life that is original and of value. Think about how you came to that originality. Businesses need to do the same thing and ask how did that fast-selling product really get developed? Corporations need to map the “creativity circles” inside their organizations, especially the informal ones. But you need to prepare yourself to be mindful. The key to creativity is knowing what is meaningful in the context and that is true in science and engineering as it is in art and music. We spend most of our time focussing on technology and associating new technology with innovation. But understanding what beckons us, what is meaningful, is critical to learning how to connect the dots of knowledge. Try it as a game. So….Shoes and the internet–Zappos. Friends and the Internet–Facebook. Sharing cars, not owning them–ZipCar. Green detergents that are cool and hip, not brown and awful–Method. Songs we can choose and technology–your playlist. You also need to be masterful. You need to dig deep into your field or your hobby and understand its history and context in order to see what could be different, what could be used in another way. You need to master both knowledge and skills–the skills of creativity that I talk about in my book. I guess you could call that the “3 M’s” –Be Mindful, Meaningful and Masterly. 2. I was really intrigued by a section of your book called “Donut Knowledge,” in which you provide some riveting examples of people who looked beyond an obvious problem and saw a deeper problem requiring a more creative solution. Could you talk about this “donut knowledge” and how to cultivate it? It took me about 10 years to become a decent birder. Birding is all about seeing the “odd duck.” You spend years in the field training to look for what’s NOT there. In Singapore four years ago, I saw a black swan. It didn’t surprise me. I was looked for what didn’t fit the pattern. That’s what “Donut Knowledge” or “Donut Thinking” is about. You spend the time to learn the patterns and then you train yourself to look for what doesn’t fit. In the book, I tell the story of Paul Polak, the renowned development guru, who went to Orissa in India to help solve the problem of clean water. Bringing clean water to villages would be a hugely expensive proposition of dams and pipes. Polak, because of his years in Africa and Asia, could see that the REAL problem was not water but cleanliness. Villages had plenty of water, but it was undrinkable. Solving the cleanliness problem was cheap and easy–chlorine. He partnered with IDIOM, the wonderful Indian innovation consultancy, to build SpringHealth, which now delivers clean water all over Orissa. He hopes to build it into a $1 billion company. 3. Pink Blog readers are creative people already. What’s something they could do today to increase their CQ? This is what I teach in my Creativity and Capitalism class at Parsons. The fastest way to increase your creative capacities is to hang out with more creative people. Bring creative people into your work, your hobbies and your life and learn from them. See what they do and how they do it. And, if you can, teach brilliant students at a great school, as I have. Then travel to strange, unfamiliar places. Reframing is a critical creative competence in the book and travel forces you to reframe your tacitly held assumptions. I birded in the Amazon with Achuar guides whose fathers were headhunters. The Achuar eat monkeys they kill with blowguns. They are just learning about money and markets and don’t yet understand how they work. The Achuar believe the spirit world is real and being awake is like being asleep. They bury all their dead under their bed to keep them close. The Achuar see us as savages because we burn up the dead or put them in places far away from the family. Now, that’s a reframe of a lot of assumptions. Finally, get your “poly” up, as in polymath. Every five or ten years, learn something entirely new. Make it fun–birding, hunting, climbing, playing an instrument. Study some field of interest, like the Rolling Stones and the rise of electronic rock music. Learning a new knowledge domain can give you new dots to connect, provide deep context for seeing patterns of relationships and connect you to creative people and wanderers. Do this every five to ten years. My last two have been birding and collecting Native American art–both were incredibly important to my understanding creativity and innovation. Before that I was deep into rice. You? I sense a passion for music, especially passionate, at least semi-primitive music. Bruce has spent considerable time in Jungles and he references the “Rolling Stones, which I think supports my hunch. I have co-founded a “school of Blues” and produced as well as hosted shows based on the music enjoyed along the Mississippi River. I enjoy writing and speaking styles. What I do not enjoy is that you seem to not read anything older than a couple months or years. CREATIVITY ASSESSMENT by Gerard J. Puccio, Ph.D. and Mary C. Murdock, Ph.D.
to name only 2 of many in print since 1950. True…creativity has been around even before the developed brain. What is different about today’s studies, though, is we now can more fully understand how, why and where these “ah ha” moments come from. This is thanks to the real-time mapping capabilities of neuro research. So, personally, I enjoy reading more of the recent research of creativity due to it’s scientific/logical connections (almost an oxymoronic statement). The science helps those who only believe in “you either have it or don’t” to learn HOW to develop their own creativity- a notion foreign to logic-based thinkers. These “finds” of yours, these authors and idea-generators, are so interesting and useful. Just wanted to thank you for the work you do to make us all better. The 3 M’s here appear to be iterative- I need the breathing space of mindfulness to see what’s meaningful, and need that somewhat mysterious gift of understanding what’s meaningful to move on to mastery of what’s pertinent. It seems as if we would’ve arrived there and everything would be fine- but we’re actually talking about coffee breaks leading to a day’s insight about what’s important, leading to mastery of what skills or steps we need to avail ourselves of that meaning. Or versions of that process that takes weeks, or years, depending on the subject and where we are on the expertise range. It’s a useful way to divide up the key professional parts of my life, these three steps. Thanks for the coverage, Daniel. Interestingly, Scott, I connected the 3 Ms in reverse order: someone who practices and hones a skill to attain mastery would then realize how the tricks and tips of experts were meaningful (thereby evolve their tricks), and finally move to a stage beyond brilliant skill by adopting a mindful approach to what they do. Agreed, Scott. But, don’t underestimate the power of naïveté. The “experts” would have also “arrived there sooner” if all it took was a step-wise logic-based approach. Innovation and creative solutions often come from outside the particular field of expertise. But what a fun “problem” it is! I’ve faced the same “numb” execs- sometimes to no avail. That’s when I know it’s time to move on…when the “uppers” are so set in processes and harshly enforce them. Those companies will not thrive, so it becomes an easy decision. How does a a former assistant managing editor of Businessweek become a Professor of Innovation and Design? That’s a story I would love to read! Thanks for the article, I enjoyed it!